The OnePlus 2 has been confirmed as the first 'big-brand' phone to offer 4GB RAM, giving it more memory than some laptops. Will there be anything left to reveal on the OnePlus 2's 27 July launch date? On its official forum, OnePlus has announced the new phone will have 4GB of RAM, making it the first major western phone brand to offer it as standard. The Asus ZenFone 2 offers a 4GB version, but good luck finding that sold anywhere. 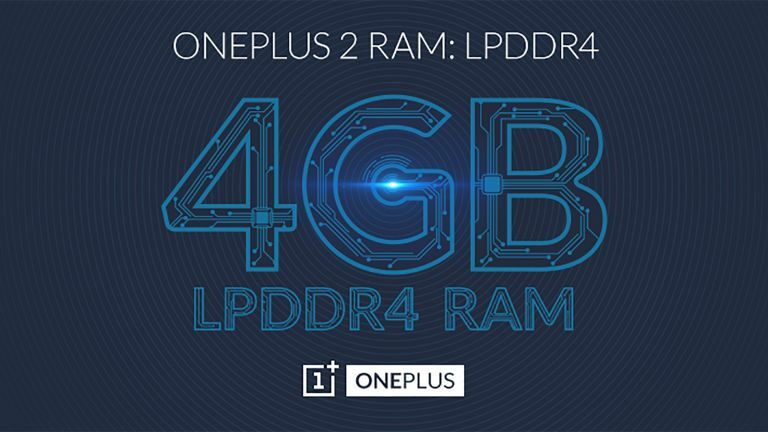 The OnePlus 2 doesn't use just any old RAM either, but LPDDR4. It's the latest speed standard among phones, used by just a few top-end mobiles including the Galaxy S6. With it, OnePlus promises "faster loading times, smoother gameplay, and never-before-seen energy saving features.” It claims LPDDR4 lets you switch between apps while using less battery, which could come in handy when none of the other 2015 flagships are stamina superstars. Being able to use 4GB of RAM is one of the first obvious advantages of using a 64-bit processor we've seen, even though we've been using 64-bit phones for almost a year now. Want more OnePlus action? The phone will be officially announced on 27 July, or the small hours of 28 July in the UK. OnePlus claims this is the "last OnePlus 2 announcement” we'll see until then.